View the entire table of contents for the April 30, 2000 issue. April 30th, 2000 Sine Qua Non A fox in the cult wine henhouse By James Molesworth How's this for a story line? A wine-savvy restaurateur, tired of begging for California's cult wines, starts his own small winery--and he beats the cults at their own game. 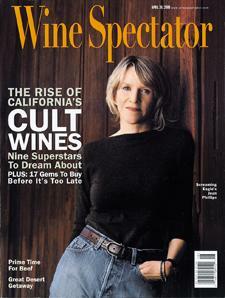 For the full article, check out the new issue of Wine Spectator, on newsstands April 30, 2000.